GoSports Foundation is a non-profit venture working towards the development of some of India’s top talents in Olympic and Paralympic disciplines, through our athlete scholarships and knowledge building programmes. We are joined by India’s only individual Olympic gold medalist Abhinav Bindra, former Indian cricket captain Rahul Dravid and All England Badminton Champion Pullela Gopichand on our Board of Advisors as well as the former physiotherapist of the Indian Cricket Team John Gloster as our Head of Sports Science. 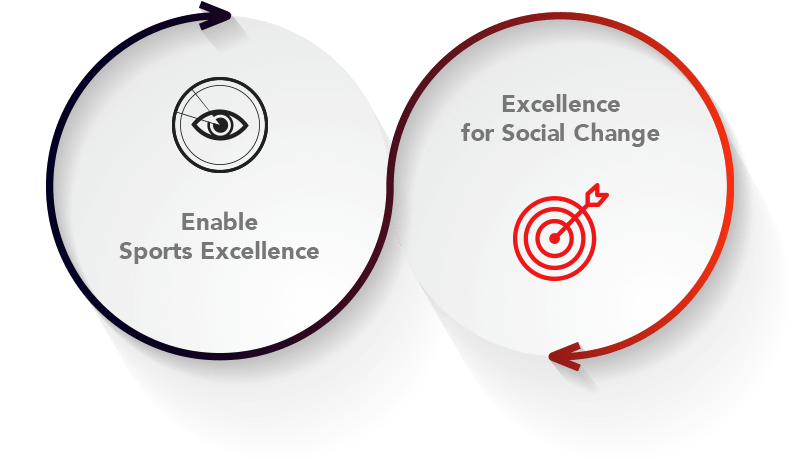 Vision: We have directed our projects and initiatives towards Enabling Sports Excellence. Mission: Our mission is to use sports excellence as a vehicle for social change and a tool to improve the lives of individuals, communities and the state of our nation. Being the first Indian to win an individual gold medal at the Olympics (2008 in Beijing), Abhinav Bindra is India’s most successful Olympian and a recipient of the Arjuna Award and Rajiv Gandhi Khel Ratna Award. He is the first and only Indian to have held both the World and Olympic titles at the same time. He is grooming the next generation of gifted athletes through the Abhinav Bindra Targeting Performance Programme. Celebrated as the most technically gifted batsman of his time, Rahul Dravid has more than 12,000 runs in Tests and 10,000 runs in ODI cricket. He was awarded the ICC Player of the Year and Test Player of the Year in 2004. Rahul brings his experience and knowledge of high-level competitive sport and his insights on management and administration to the board. Through the Rahul Dravid Athlete Mentorship Programme, he helps elite athletes across Olympic disciplines to cope with the rigors of competing at the highest levels. Former All England Champion and current Chief National Badminton Coach Pullela Gopichand has been responsible for the emergence of Indian badminton players as a force to reckon with. His work has been recognised by the Government of India through the prestigious Rajiv Gandhi Khel Ratna award, Arjuna award, Padma Shree award and Dronacharya award. At the Foundation, Gopichand has guided us in conceptualising earlier version of Athletes’ Conclave and currently guides with our Education initiatives. Nandan runs a boutique sports and intellectual property law practice in Bangalore advising the country's top athletes, governing bodies, teams and brands. He is a graduate of Harvard Law School, the University of Oxford (on a Rhodes scholarship) and the National Law School of India. He was an avid cricketer at the junior level, representing the India Under-16's and captaining the Karnataka state team. Previously, Nandan has worked in California, Hong Kong and India. Abishek was a world ranked junior tennis player and a US varsity tennis athlete. He graduated, with honors, with a bachelor’s degree in Economics and Computer Science from Cornell University in Ithaca, NY. He is the co-founder of Indavest Ventures LLC, an early stage Venture Management company, with a presence in India and the US, that plays an active management role in each of its portfolio companies. Abishek is also founder and Managing Director of Surya Infotainment Products, a Bangalore-based information aggregation company with a retail presence. Mr. Ollapally graduated from one of the early batches of the PGDM Programme of the Indian Institute of Management, Ahmedabad. He is currently the Managing Director of a reputed Bangalore based property development company. With over 35 years of professional experience, he brings a wealth of knowledge and management expertise to the table. An avid sportsperson himself, he believes that nurturing the right talent at the right time will help foster a sporting culture in India. Deepthi Bopaiah, formerly a wealth advisor and a trainer during her stint of 6 years with HSBC, joined GoSports Foundation in 2012 after deciding to pursue a longstanding interest in sport. A sportswoman herself, she has previously represented her University and Karnataka State in tennis and basketball. Deepthi holds a Business degree in Finance and Marketing from Symbiosis, Pune and a Masters in Economics from Pune University. Head of Sports Science at the GoSports Foundation, John is an Australian sports physiotherapist of 24 years’ experience, working with both elite athletes and the general sporting population. He has worked extensively with international cricket for the last 17 years, most notably as physiotherapist to the Indian cricket team for 3.5 years as well as Surrey County Cricket in England (1998-2001), Bangladesh National Team from 2001-2004, and Rajasthan Royals (IPL Franchise Team) for 8 years. John is often seen on numerous TV shows in India for expert comments on sporting, health, lifestyle and injury related issues both in the sporting as well as the general population. He currently sits actively on 3 advisory boards for school and health related projects in Mumbai and across India. John is also board advisor and Chief Quality Officer of KOOH Sports. Unmish works at the intersection of content, commerce & culture - facilitating the digital transformation of media, sport & entertainment concerns, creating new markets of digital demand, and mentoring startups in SportsTech & VideoTech. Educated at Cambridge, LBS and St. Stephen’s, Unmish lives in Singapore, his 5th home after spells in London, New York, Johannesburg & Delhi where he was born. Dr Debashish Das is an accredited and registered physiotherapist with both the Indian and Australian Physiotherapy Associations. He is an associate member of Sports Medicine Australia and Sports Physiotherapy Australia. He has developed a niche in the field of Golf and Olympic sports injury prevention and management. He enjoys developing exercise programs and encourages an active patient centric approach to complement a manual therapy-based treatment methodology. Shrikant Iyengar is a qualified physiotherapist who completed his Bachelors from Rajiv Gandhi University of Health Sciences Bangalore. In March 2007, he was appointed the physiotherapist for the National Hockey team of India and held that position for 7 years until 2013. He later pursued a Masters in Sports Physiotherapy from the University of Curtin, Perth in 2014 and was offered the position of Head Physiotherapist; H.O.D Athlete Rehabilitation for Hockey India, which he held from June 2015 up until December 2016. Ryan Fernando is an award-winning celebrity sports nutritionist, a graduate from IIM Ahmedabad, a Commonwealth Scholar with 2 Masters Degree, Food Bio Technology from University of Strathclyde and Clinical Biochemistry from University of Goa, has nurtured a host of top level Athletes in the country. Ryan’s clients include 2 Guiness world record Holders in feats of Human Endurance, Wrestler Sushil Kumar, Indian International Cricketers like Shikhar Dhawan, Yuvraj Singh, top level golfers, squash players and a long list of athletes in other sports. Aparna worked as a German language translator with Robert Bosch India Limited, but then decided to follow her passion for sport and joined GoSports Foundation in 2015. She holds a Bachelor’s degree in German Language and Literature Studies from Fergusson College, Pune, and a Masters degree in Sport Management from Loughborough University, England. She trained in Taekwondo during her school days and follows cricket and tennis avidly today. Sumathi Kamath is a graduate from Mangalore University with a first-class degree in Accounting and Finance. She did three years of CA articleship and audit assistance under one of the famous chartered accountancy firms in Bangalore; ‘Amarnath Kamath & Associates’ and worked for seven years with the firm in accounting & financial reporting post completion of her degree. She has also worked Geberit India as a Senior Executive Finance and her traits include being flexible & focused. Sumathi further likes to maintain a calm and professional demeanour at all times. Vandana Nayak holds a Master’s Degree in Human Resource Management and has a total of 14 years of professional experience, working on various Human Resources fields . She is working with Copyright Integrity Advisory (India) Pvt. Ltd (CII) as a manager in HR & Administration and worked for 6 years with Acropetal Technologies Limited as a HR Executive. Vandana is multilingual, knowing the languages English, Hindi, Kannada and Konkani. She is a keen follower of Badminton and her interests include reading and meditation. Shreyas is a sports enthusiast and has been involved in several research and on-field initiatives over the last three years. Formerly an engineer, he completed his postgraduate degree in social entrepreneurship from the Tata Institute of Social Sciences in 2014. He pursued a research dissertation on football academies of Kerala as a part of the course. Post that, he worked at Jungle Crows Foundation which is involved in supporting children from disadvantaged communities through the medium of rugby. At GoSports Foundation, he hopes to mainstream "sports thinking" to play an active role in professional sport as well as policy making in the Indian context. Sumanth is a BBA-LLB graduate from Karnataka State Law University. Being fascinated with sports and entertainment law, Sumanth developed a particular fondness for sports management with a stint at the Champions Tennis League. He is an avid motor biker who is passionate about exploring cultures within India. Apart from cricket and tennis Sumanth keenly follows motorsports and badminton. At the foundation, Sumanth seeks to use his legal education and his keen interest in sport for the wellbeing of its beneficiaries. Abhishek has completed his Bachelors in Business Management from Acharya Tulsi National College of Commerce, Shimoga. He is currently pursuing his Chartered Accountancy (CA) and has completed his Articleship Training from A Narasimha Murthy & Co, Chartered Accountants, Shimoga. Abhishek is presently associated with SKFINPRO, Financial Consultants, Bangalore and working in Finance Team at GoSports Foundation. His hobbies include playing cricket, Baminton and listening to music. Kaushik has graduated with a Bachelor's degree in Mechanical Engineering from NMIT, Bangalore and has worked with GE Healthcare before joining GoSports Foundation. He has been playing cricket for the past 14 years and has represented the State at junior levels and the University Cricket team. He is also a keen football follower and a Manchester United and BFC fan. Apratim has completed his Masters in Organisational Psychology from Christ University, Bengaluru. A state level handball player, he has also represented his university handball team in multiple tournaments. His passion for sports and keen interest in organisational psychology is what guided him to apply at the Foundation. He wishes to work with the Foundation on its quest of enabling sporting excellence! Anand is an ardent sports fan and holds a Masters degree in Communications Management from Symbiosis Institute of Media and Communication, Pune and also holds a Certificate in Sports Analytics from Symbiosis School of Sports Sciences. He is a die hard Liverpool Football Club fan and to experience the famous Anfield night atmosphere during a UCL clash is one of his personal wish. Shripoorna is a former badminton player and was a trainee at the Prakash Padukone Badminton Academy. Having finished his schooling by delving into the world of Sciences, he transitioned into the world of Arts by pursuing a Bachelors of Arts majoring in Communication and Media, English Literature and Psychology. Whilst studying, he also worked at a newspaper and became one of the youngest journalists to have been accredited by the BCCI and cover an International Cricket match in India, and was also the youngest to cover the 2017-18 season of the Indian Super League. His interest in sports, business & management, and relationships has driven him to carve out a career in Sports Management. Kundan is an engineering graduate in Electronics & Communication from Cochin University of Science & Technology. He is passionate about badminton and has played the sport at University and State level. Today, sport is not just a passion or means of entertainment for Kundan but an enjoyable profession involving assisting athletes to fulfill their sporting potential. Arun is a Sports engineer with an MSc. from Sheffield Hallam University, UK. He started his career as an IT associate, but his passion for sports made him switch to sports engineering. He is also a certified fitness instructor and worked as a trainer for Reebok Running Squad. He loves running and holds a 5 km personal best of 0:18:39. A Computer Science Graduate from Jain University, Bangalore, Yamini has worked with various sports-based companies such as Decathlon, Sportscurry, AddRush and Sporthood. She held the Karnataka 100 meters Junior record of 12.00 seconds for several years and is the current fastest winger of the Bangalore Women's Rugby Team. Ultimate Frisbee, Cycling, Slack-Lining, Yoga and playing FIFA along with several coffee breaks are her current obsession. Madhura is a graduate of Biomedical Engineering from Dayanandasagar College of Engineering, Bangalore. In her student years she represented Karnataka State in Football and Volleyball. Despite being an engineer, she chose GoSports Foundation to pursue her passion for sports professionally. Lakshman has been a part of the GoSports Foundation since 2016 and looks after the Admin Department at the Foundation. He has previously worked with Qbix Integrated Services Pvt Ltd for a period of 5 years in the role of a Telecaller and later as Assistant Team Leader. Lakshman is very fluent with languages and can speak four different languages (Kannada, Telugu, Tamil and English). He is also an avid dancer and along with his twin brother Ram, he runs a dance group RL Twins who train kids. His hobbies include playing Carrom and following the sport of Swimming & Badminton closely. With multiple ATP tour titles to his credit and a career-high World doubles ranking of No. 8, Rohan Bopanna is a much-respected name on the tennis circuit. After having pursued a successful partnership with Aisam-ul-Haq Qureshi and reaching the US Open doubles final in 2010, Rohan made his Olympic debut in London with partner Mahesh Bhupathi. Rohan is actively involved with multiple causes and has been a longstanding supporter of GoSports Foundation in his quest to support young Indian athletes with journeys similar to his own. Called the ‘Indian art house icon’, by TIME magazine, Rahul Bose won the Best Actor award at the Singapore Film Festival for ‘Split Wide Open’ and the runner-up prize of the John Schlesinger award for Best Debut Director for his film ‘Everybody Says I’m Fine!' at the Palm Springs Festival. His two NGOs, ‘The Foundation’ and 'HEAL', seek to reduce regional inequities in India through education and child sexual abuse respectively. A former international rugby player, Rahul represented India from 1998 to 2009. Vikram Sathaye has the distinction of being the first English standup comedian in India and has performed in more than 1300 corporate events across the world till now. In 2003, Vikram got an offer to be part of Extraaa Innings on Sony Six as a cricket humourist, and the rest is history. Vikram’s TV stints include Presenter on Set Max during the World Cup in 2003 and Champions Trophy 2004, India’s tour of South Africa on ESPN Star Sports in 2006 and the ICC World Cup 2011 on IBN LokMat. A former India No. 1 in tennis, Arjuna Awardee and a Davis cup veteran, Gaurav was a double gold medalist at the Hiroshima Asian Games in 1994 and at the 3 South Asian Federation Games held between 1993 and 1997. Originally from Pune, he completed his graduation from Madras Christian College and is now working tirelessly to ensure that India’s latent talent for tennis is successfully nurtured in his role as CEO of Mahesh Bhupathi Tennis Academy. Born and brought up in Pune, Kunal is a huge sports enthusiast, a football fanatic and an Arsenal fan. He did his MBA from Clark University, Massachusetts, USA, is currently on the Board of Directors of Bhoruka Logistics Ltd. and Koolex Cold Chain Ltd. He is passionate about raising the bar for football clubs in India and has launched two professional football clubs himself.